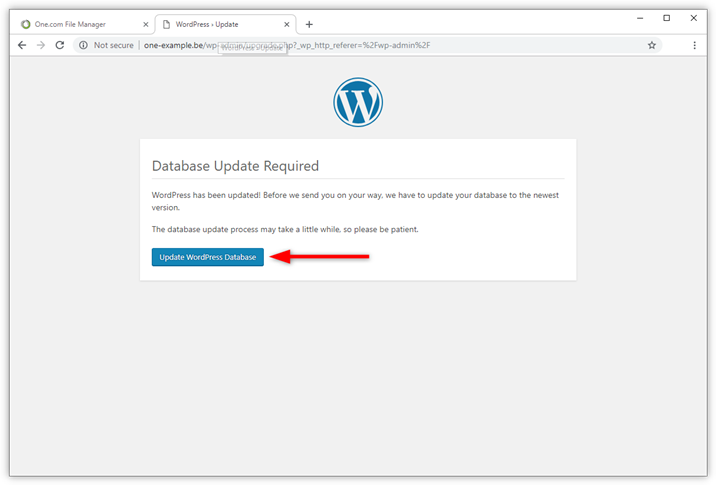 Normally you can update WordPress with one click from the WordPress dashboard. Minor updates are even done automatically. It may happen that you cannot access the WordPress dashboard. In that case, you need to do a manual update. 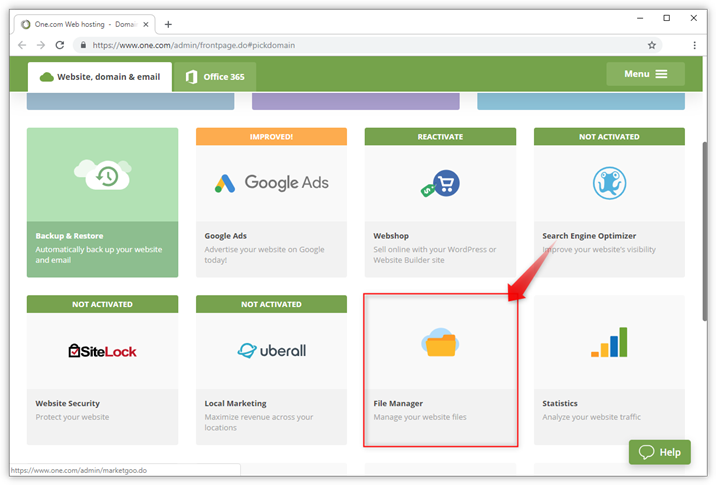 In this guide, we use File Manager to upload the files, but you can also use an FTP-client like Filezilla. Note: Before you continue we recommend that you make a backup of your site and disable active plugins. Check out our guides below if you are unsure how to do this. 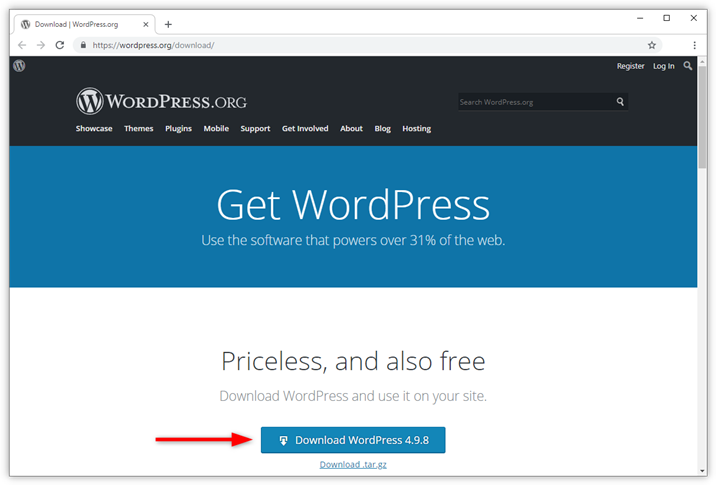 Download the newest WordPress installation files from the WordPress website to your computer. 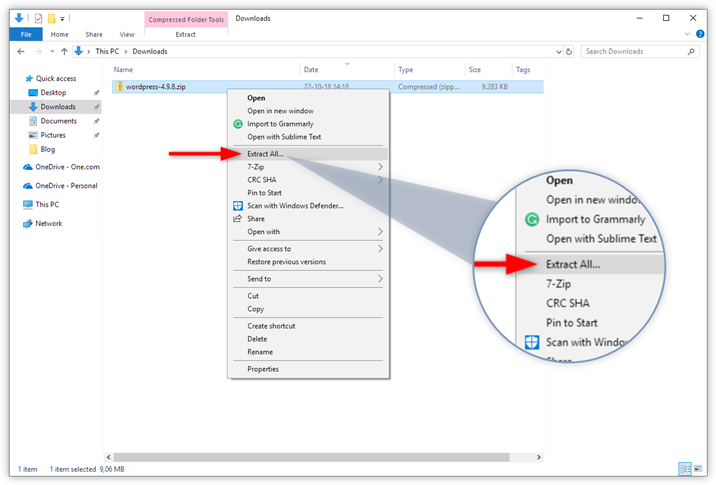 Extract the zip file that you just downloaded to a location on your computer. 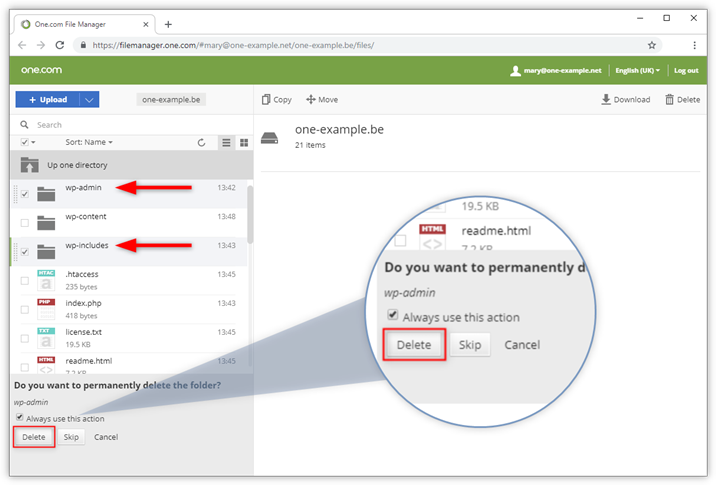 Open the folder where you extracted the WordPress files, and keep it open on the side. Log into the One.com control panel. Upload the folders wp-includes and wp-admin from your computer to your web space, replacing the ones you just deleted. You can simply drag the folders in File Manager and drop them in the box in the bottom left corner. Note: The folder name is italic and a lighter grey while the upload is still ongoing. It can take a few minutes to complete, depending on your internet connection. 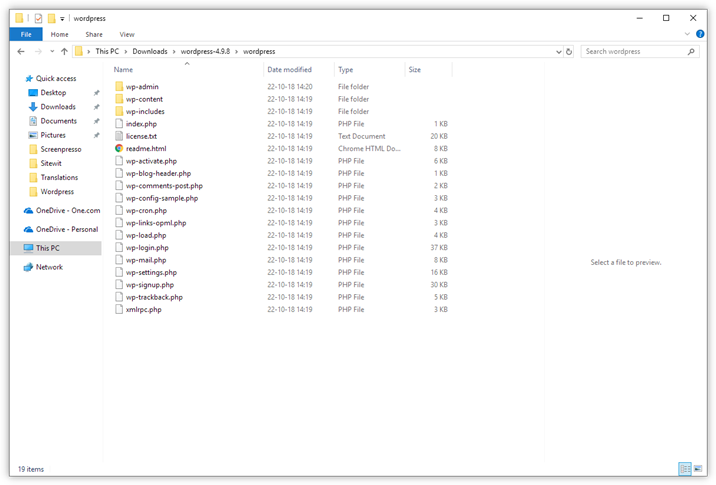 Open wp-content and upload the files and folders in this folder from your computer to the corresponding folder on your web space. 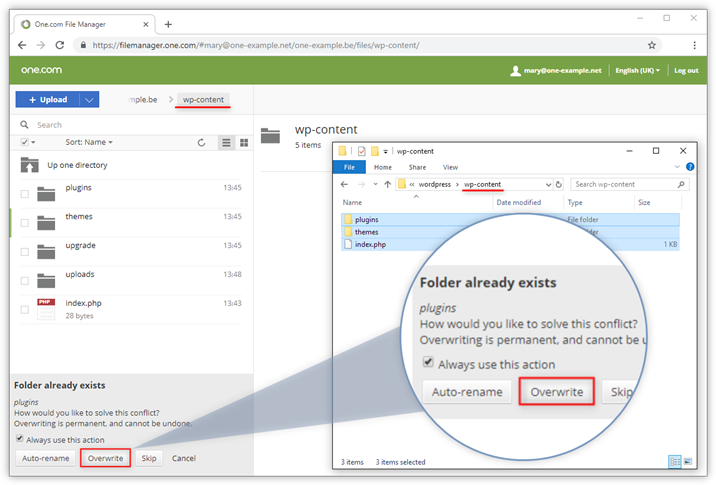 You overwrite the existing files, but keep any other files and folders that are there. 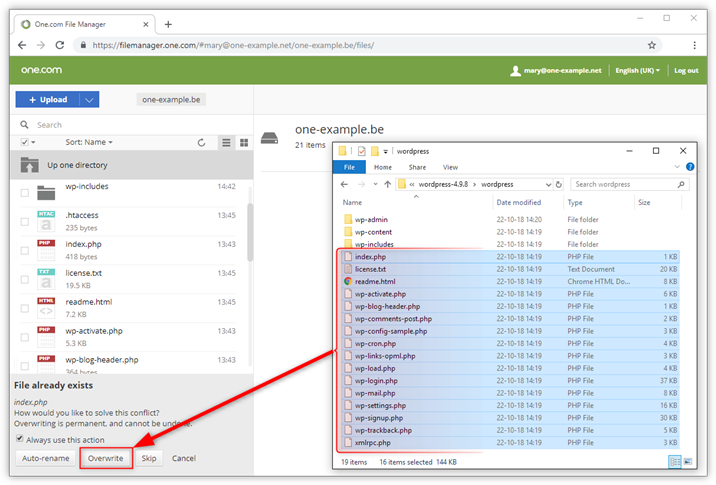 Note: The wp-content folder contains your plugins and themes so make sure not to delete any files and folders that are already there! Upload all individual installation files that are not in a folder from your computer to your web space, overwriting the existing files. You have now done a manual update of WordPress. You might need to update your database. If this is the case, you will be prompted to do so when you log in to WordPress for the first time. Tip: Check for updates for your plugins and themes and remember to reactivate all plugins once you are logged in. What is the One.com plugin? 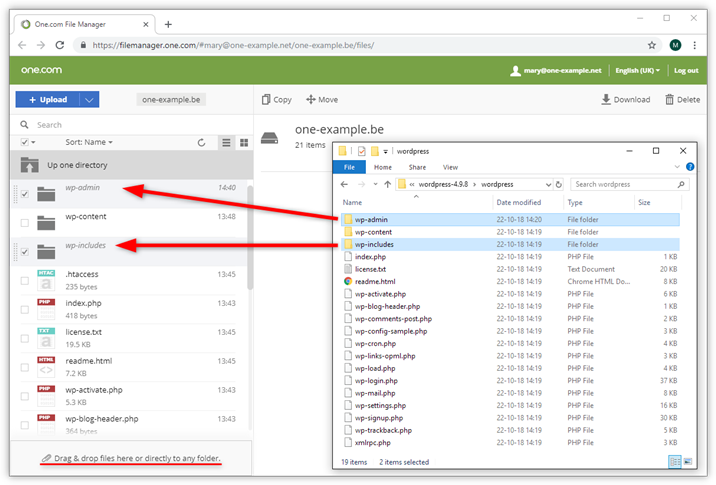 How to use the Performance Cache plugin for WordPress? How do I install WordPress manually? How do I repair a hacked WordPress site?